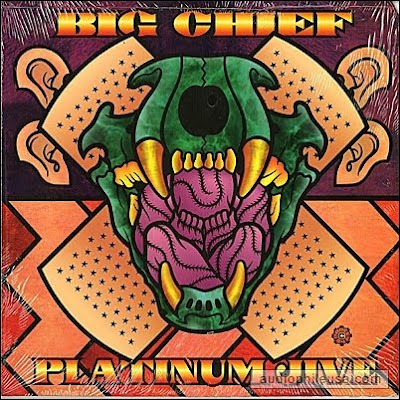 Ritual Room: Album: Big Chief - "Platinum Jive"
Oh man. I finally get to post this one. Here is an album I've been meaning to post since I started this blog - "Platinum Jive" by Big Chief. I absolutely love this band and this is my favorite thing they released in their too-short existence as a group (well... aside from "Face". I think it's a tie). It's still catchy as hell but with a bit more grit and less funk (but still a copious amount) than their previously released work. It's a great mix of fun and grime and actually, in thinking about it further, I think a major part of the reason I'm so in love with this unique work is the track "John's Scared" which I'm basically addicted to. And "Locked Out". Ugh. Ok. Maybe it's just the entire album. Awesome - I only have this on picture disc. Any chance of posting Face too??? oh hell yes I can post Face. I also had a terrible time finding MP3s of both albums. i got their mini, drive it off. if you aint got this, tell me and i can upload somewhere.